Isaiah the greatest of the prophets told the story of the Lord’s passion seven hundred years before the birth of the Christ. The prophecies of Isaiah are so clear that he even provided the world with the name of the Lord: Emmanuel — God is with us. As it is written: the suffering Messiah was born into the world, not to be an earthly ruler, but to be a suffering servant who dies on the cross. “He shall take away the sins of many and win pardon for their offenses (Isa 53:12c).” These superior oracles give a crystal clear depiction of Jesus and his Passion and are as important today as they were in biblical days. 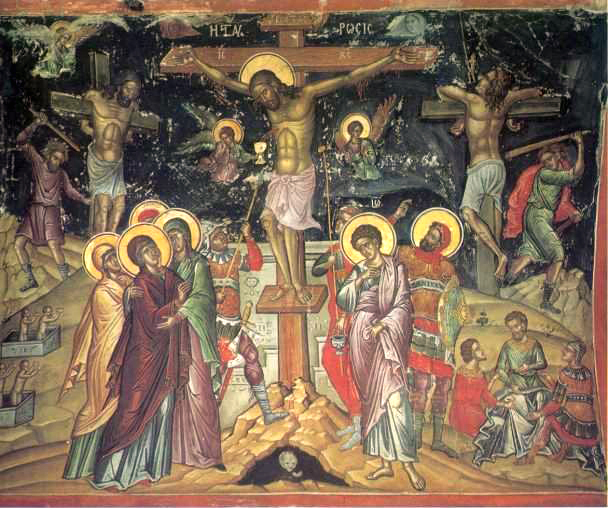 Good Friday is the most somber day on the Christian calendar; it is a day of contrasts. Life through death. God’s truth in place of lies told by the world that does not believe in God. Fear replaced by faith. On Good Friday we pray with gratitude for the death of The Lord and to prepare to share in his Resurrection. From the hill of the Cross the mountain of Easter can be difficult to see. There is no other way to arrive at the glory of the Resurrection but to suffer first the horror and shame of the cross. The Good Friday commemoration is how we keep alive and present the passion of The Lord and prepare to receive the truth of eternal life that springs from the empty sepulcher. The Story of God in the world is ancient; it could not have been written by any man. The prophet Isaiah was so powerful that Saint Jerome, the Church’s patron of Bible studies, called him “the Fifth Evangelist.” Like the New Testament writers, Isaiah describes that God is in the world and offers salvation — through the cross, not through powerful triumph. We follow a crucified Savior. There can be no faith in Christ without taking up our crosses and following him toward the ultimate destination: Calvary, crucifixion, death to self. Christ was born to suffer, die, and to rise again. He tells Pontius Pilate: “For this I was born and for this I came into the world: to testify to the truth. Everyone who belongs to the trust listens to my voice.” Today on Good Friday this truth breaks out all over the world. The Passion remains living and active because we celebrate it annually and its presence and power plans out during the remainder of the Church calendar. This solemn truth goes on living in the daily reality that proclaims the gospel of who we are: a suffering people that follows a suffering Messiah who offers us, through baptism, the glory he received, as our spiritual birthright. God chose to save the world through the cross. Isaiah wrote the truth to those who wanted to know that God is near, those who did not know that the crosses borne by others were meant for them also. When Jesus came into the world, he did not appear as the earthly ruler that many expected. “Are you a king?” Pilate asked. Not exactly, Jesus replied. I am a man of suffering, accustomed to infirmity, one at whom men and woman would rather not look but turn their faces from me. The sight of Jesus on the cross was too painful to bear. If we are to rise with him on Easter then we must be crucified with him. The view from the cross is very different than the view of the cross. Good Friday is a sober day, to reflect on the Passion and to be grateful for God’s sacrifice of his only Son. We celebrate the Passion to preserve the memory of Jesus Christ. 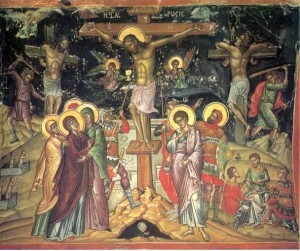 Good Friday is the fulfillment of the promise God made thousands of years ago, proclaimed by the prophet-evangelist Isaiah. The Son of God shall take away the sins of many, and win pardon for their offenses. We celebrate because we are the many.